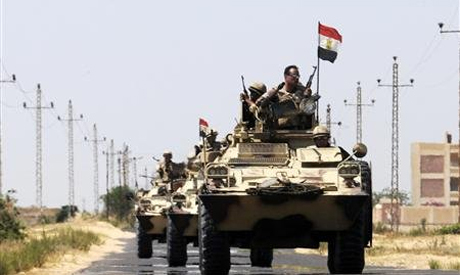 Egyptian security forces have killed 78 suspected militants, including 32 foreigners, in recent operations in the Sinai Peninsula, military spokesperson Ahmed Ali said on Friday. The operations injured around 116 people, Ali added via his official Facebook page. Ali confirmed that 203 people, including 48 foreigners, had been arrested for their alleged involvement in attacks on security checkpoints in the peninsula. He also said that 343 tunnels on the border between Egypt and Gaza at Rafah have been destroyed. Last Tuesday, at least 25 Egyptian policemen were killed when suspected militants ambushed a personnel carrier near Rafah. In August 2012, an attack by unknown assailants killed 16 army conscripts in Rafah. Then-president Mohamed Morsi conducted a security reshuffle that saw army intelligence chief Abdel-Fattah El-Sisi appointed defence minister. Attacks against security forces have escalated since Morsi's ouster. Sixty people have reportedly been killed in attacks on security checkpoints in Sinai since Morsi was deposed by the military on 3 July amid mass protests against his rule.